1. 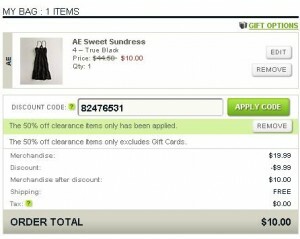 Go to ShopAtHome.com and then click on the American Eagle SHOP NOW button! This will ensure you get savings from ShopAtHome.com. 2. On the right side of the American Eagle homepage click on Womens or Mens Clearance. Add the products you want to purchase to your shopping cart. 3. At checkout enter Discount Code: 82476531. This will give you an additional 50% off all clearance products plus Free Shipping. 4. Your shopping cart should look similar to this. Now all you have to do is pay. In 30 days or less you will receive your 9% cash back + your $5 first time order in your ShopAtHome.com account.